US Philadelphia Mint: View images and history of the oldest of all USA Mints. Mint Mark: No mint mark, except "P" on 1942-1945 nickels, 1979 Susan B. Anthony, and all coins 1980 and newer, except cents. The US Philadelphia Mint began construction in the summer of 1792, the first federal buildings erected under the Constitution for public use. This chapter retells the fascinating history of the US Mint in Philadelphia, supported by many images. The Philadelphia facility is often viewd as the Mother of all USA Mints. Hit the "Saga of the US Mint" link at the upper right to choose other US Mint facilities to study. The headings directly below are units of the Philadelphia Mint chapter. Not long after Constitution was ratified, President George Washington and other government leaders sought to create a national mint. They believed that coinage bearing the name "United States of America" would help establish the identity of the new nation, in addition to serving the needs of commerce. 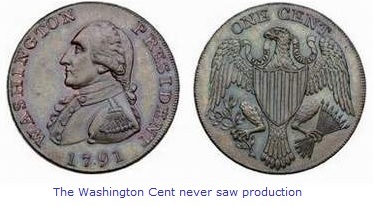 The "Washington cent" was minted by an overseas contractor. President Washington rejected the proposal as "monarchical" and also noted that he was against contract coinage, especially from outside the country. Photo courtesy of Ira & Larry Goldberg Coins& Collectibles, Inc., Beverly Hills, CA. While legislation was being drafted to authorize a national mint for the United States, a grassroots movement in favor of depicting President Washington on the new coinage was underway. After all, European rulers were known throughout the world because their faces appeared on coins, so why shouldn't the American president be likewise revered? Washington himself rejected that idea, saying it reminded him too much of a monarchial practice, something the Americans had fought so many years to be free of. With that question settled, the wording needed for the proposed legislation became clearer. The Mint Act of 1792 became law on April 2. Most importantly, the Act proclaimed the creation of the United States Mint. Because Philadelphia was at that time the nation's capital, the mint facility was directed to be built there. Secondly, it instituted a decimal system based on a dollar unit, and based on that, what denominations were to be coined. Weights, metallic composition, and fineness were also specified. Among other things, the Act required that each United State coin feature "an impression emblematic of liberty". With the passage of the Mint Act of 1792, the story of United States coinage began. We have prepared another chapter, The First US Mint Survives Political Strife, where our website guests can also read about the creation and first decades of the United States Mint. As you will learn, the Mint battled for many years simply to exist. The chapter also spells out the role the Mint played in the early political development of the United States, and goes into some detail, including illustrations, of the first Mint's machinery. David Rittenhouse, the first Director of the US Mint. 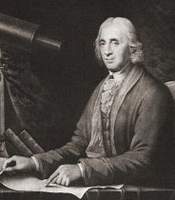 At the time, Rittenhouse was one of America's leading scientists with a highly regarded reputation. Public domain image. President Washington appointed David Rittenhouse to be the first Director of the Mint. On July 18, 1792, Rittenhouse purchased two contiguous lots located at Nos. 37 and 39 Seventh Street and 631 Filbert Street in Philadelphia for $4266.67. The next day, workmen began demolishing an abandoned whiskey distillery occupying a portion of the property. On July 31, foundation work for the first building began. By September 7, the building was ready for the installation of the smelting furnace (used to separate ore into its metallic constituents), thus completing the very first public building erected by the United States government. A few months later, a three-story brick structure fronting Seventh Street was constructed. This was the tallest and most visible of all the first Mint's buildings, and would come to be known as the "Ye Olde Mint" building. (the word "Ye" was Old English spelling for the word "The", and was pronounced as "The"). Many people erroneously believe the "Ye Olde Mint" building was built first, but according to Don Taxay's meticulous research in "The U.S. Mint and Coinage", the honors go to the smelt house. In between the "Ye Olde Mint" building and the smelt house, a frame mill house was then built, having a basement where horses turned a rolling mill on the ground level floor above. The 1793 "Chain" cent, the first coin released into circulation by the US, made by the Mint's original employees, assisted by the power of horses. Image courtesy of EarlyAmerican.com. The three-story "Ye Olde Mint" building measured nearly 37 feet in width and extended back a mere 33 feet. The basement contained vaults that held gold and silver. The first floor was split into deposit and weighing rooms, as well as a press room where gold coins were struck. The second floor was the place where most mint officials had their offices. The third floor held the assay laboratory for testing metals. To travel from floor to floor, one had to walk a dark, creepy stairway, dimly lit by a tallow lamp. 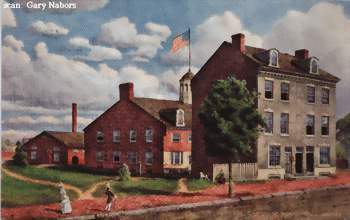 Edwin Lamazure's 1920 painting depicts how the first US Philadelphia Mint may have appeared, circa 1817. Public domain image. In January, 1816, the mill and smelt houses caught fire. The mill house was completely destroyed, and was replaced with a large brick building. In the basement of the new brick building, Mint officials installed a steam engine to power machinery on the first floor. We have another chapter named, A Rising Spirit of Nationalism, containing a section where the impact of the Industrial Revolution on the Mint is discussed. The smelt house was not repaired, so after 1816, all the smelting operations were performed elsewhere. "Ye Olde Mint" building photo, taken around 1908. Within a few years, the historic structure was gone. Public domain image. 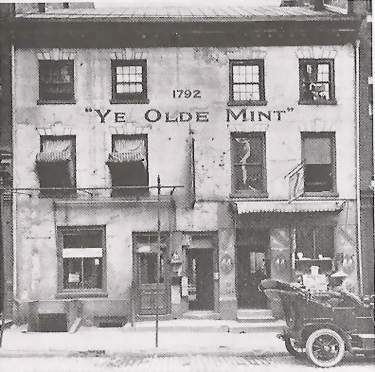 "Ye Olde Mint" and its sister coining facilities at the site of the first mint served the United States faithfully until 1833, when operations shifted to the second Philadelphia Mint, a much larger, majestic edifice. The first US Philadelphia Mint was then sold to private interests. Sometime in the latter part of the 19th century or early 20th century, a man named Frank Stewart purchased the land where the old mint buildings still remained. At some point, Stewart established an electric company in a building adjacent to the "Ye Olde Mint". Stewart pleaded with the city of Philadelphia to preserve the historic buildings or to relocate them, but to no avail. Between 1907 and 1911, Stewart had the buildings demolished. Today, the Philadelphia metropolis engulfs the intersection of Seventh Street and Filbert, the formerly quaint site where our Founding Fathers frequented in their quest to establish a national mint for the infant United States. A few photographs (taken long after mint functions ceased at the location) and artistic renditions is all that we have to visualize how the first US Philadelphia Mint must have appeared. At the busy Philadelphia intersection of Seventh and Filbert, this plaque draws attention to the fact that the first US Mint occupied this site long ago. Image courtesy of Gary Nabors. Amidst the blare of car horns and the modern day hustle and bustle, a plaque memorializes the First US Mint that stood at this spot two centuries ago. For those who appreciate American history or love the hobby of coin collecting (many of us do both), this is indeed hallowed ground. What a shame "Ye Olde Mint" was not preserved, for if it was, it would today be deemed one of the most historically significant sites in the United States! By 1829, the America's thirst for coinage outpaced the capacity constraints of "Ye Olde Mint". A piece of land on the northwest corner of Chestnut and Juniper was purchased, and on July 4, 1829, the cornerstone was laid and construction began. The second Philadelphia mint, as depicted in an 1840 lithograph by J.T. Bowen. Public domain image. 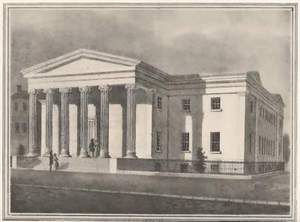 Following the blueprint of architect William Strickland, the second Philadelphia Mint resembled a famous temple located near the city of Athens, Greece, along the river Ilysus. A majestic structure for its time, the "Grecian Temple" mint building was composed of white marble, measuring 150 feet in front and 204 feet in depth. The front and rear of the building were graced by columns reminiscent of the classic Greek style. In terms of space availability and image, this was a big improvement over the first mint facility. The new mint was ready for occupancy in January 1833. Initially, the new facility limped along with the outdated machinery brought over from the first location. The Director of the Mint at the time, Samuel Moore, sent Franklin Peale (who later became embroiled in scandal) to Europe to study advanced coin manufacturing technology. Upon Peale's return two years later, many important improvements were implemented. As mentioned in the section above, we have a nice chapter, A Rising Spirit of Nationalism, which in part, examines the Industrial Revolution and the art of coin making. Weighing and filing overweight planchets. 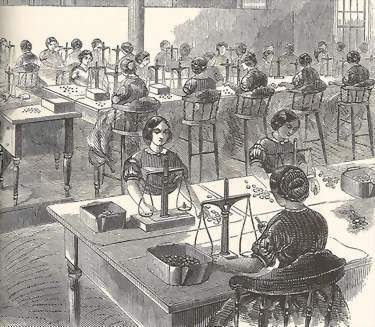 In 1850, the Mint hired forty women to supplement their adjusting staff. By 1860, female adjusters were paid 11 cents an hour in a 10 hour day, considered a generous wage in those years. Public domain image. Under the watchful eye of the "Mother Mint", new branch mints were born in Georgia, North Carolina, Louisiana, California, and Nevada. During its tenure, numerous wars were fought, including a horrible civil war, three presidents were assassinated, and the boundaries of the United States were extended from the Atlantic to the Pacific. Communications evolved from letter writing to the telegraph to the telephone, as railroads crisscrossed the nation. An invention called the incandescent lamp brought light to America's night time and changed how people lived. Indeed, as this mint dutifully carried on for many decades, the United States broke out from the middle of the pack to establish itself as a world leader in technology, military power, and prestige. While the second Philadelphia Mint continued to churn out an ever increasing number of coins, it saw the nation's population grow from 13 million to 76 million by 1900, boosted by waves of immigrants in search of better lives in the United States. As early as 1891, Congress realized the mint's capacity would eventually be outstripped by demand. In 1901, a new facility, the third Philadelphia Mint, was ready to begin coining operations. 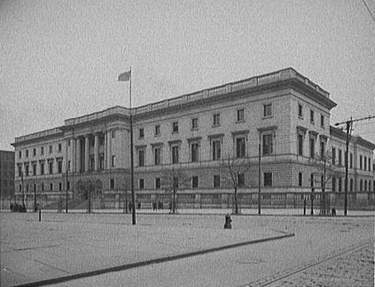 The second Philadelphia Mint as it appeared in 1902, shortly before it was demolished. City Hall is seen behind the mint building. Image courtesy of Library of Congress. The second Philadelphia Mint was sold in 1902 and razed the following year. As the demolition proceeded, workmen discovered the long ago forgotten cornerstone buried in 1833. The cornerstone contained a candy jar with a petrified cork. The jar held three coins, a couple of newspapers, and a scroll providing sketchy information on the first mint and the creation of the second. As the final pile of rubble was carted away, the second Philadelphia Mint sadly passed into history. In addition to being too small, sharp criticism of the abhorrent work conditions at the old mint at Juniper and Chestnut contributed to the decision to build a much larger mint building. The third Philadelphia Mint was built on Spring Garden avenue between 16th and 17th Streets, and opened for business in the latter half of 1901. The third Philadelphia Mint opened for business in 1901. Image courtesy of Library of Congress. Filling nearly a full city block, the massive new structure became an instant landmark, thanks to its impressive Roman temple facade. Walking past the huge columns, visitors were greeted by a lobby finished in gorgeous Italian marble. The gold-backed, vaulted ceiling featured seven glass mosaics designed by the renowned artist Louis C. Tiffany. The theme of the mosaics centered around ancient Roman methods of coin making. For its time, the third Philadelphia Mint ranked as a world class facility. The third US Philadelphia Mint remained in production until 1969, when, as with its two predecessors, the need to expand and modernize rendered the marbled wonder obsolete. During its 68 years, this mint witnessed the construction of yet another branch mint building (Colorado), two world wars, and stunning social transformations. Two years after the third Philly Mint commenced operations, the first powered flight at Kitty Hawk ushered in an age of aviation, and by the time it closed its doors, astronauts were walking on the surface of the moon. From the horse and buggy to spaceships flying overhead, the marbled mint produced coins for the United States over a period of incredible change. 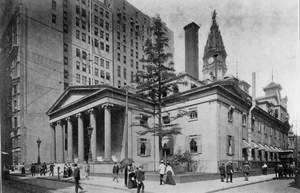 The old mint on Spring Garden still stands today, the home of Philadelphia Community College. Thankfully, much of the original grandeur remains intact, even though two of the Tiffany glass mosaics were relocated to the fourth and current Philadelphia Mint. Today's Philadelphia Mint, the largest coining facility in the world. Image courtesy of ontheopenroad from Flickr.com. 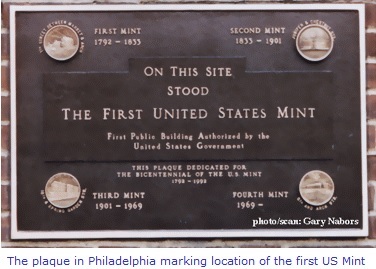 In 1969, the fourth and current Philadelphia Mint opened at Fifth Street and Arch, a scant two blocks from where "Ye Olde Mint" was built in 1792. This building resembles a plain box with very few windows and lacks the character of its predecessors, but is far more secure. The largest coining facility in the world, the Philadelphia Mint can produce a million coins in thirty minutes. To put this into perspective, "Ye Olde Mint" required three years to turn out the first million coins for the United States. In addition to striking coins, the Mint also manufactures awards for military heroes (Bronze Star and Purple Heart, for example) and other official government medals, such as the Congressional Gold Medal. Bearing the likeness of the recipient, some previous Congressional Gold Medal honorees include George Washington, Jesse Owens, John Wayne, Bob Hope, Walt Disney, and Robert Frost, to name just a few. Tourists can learn about the craftsmanship required at all stages of the minting process, from the original design to die making, bonding, blanking, striking, inspecting, counting, and bagging. It's quite a sight to see millions of coins just a few feet away! The David Rittenhouse room, named after the first Director of the Mint, displays tools and hardware from the time of Rittenhouse, as well as the deed to the original Mint. Was Peter the Eagle really the model for the bird on the Flying Eagle cent? Some researchers believe indeed he was. Coin Photo courtesy of Ira & Larry Goldberg Coins & Collectibles, Inc., Beverly Hills, CA. Another tangible link to the past is Peter the Mint Eagle. Sometime after mechanization arrived at the Mint in the earlier decades of the 19th century, a friendly bald eagle (apparently eagles still roamed freely in southeastern Pennsylvania less than 200 years ago) claimed the Mint as his home. Instantly, he became a popular mascot to the Mint employees, and was named Peter. Unfortunately, Peter was mortally wounded when he got caught up inside a machine flywheel that started up suddenly. After a visit to a taxidermist, Peter was mounted and is on display today for all to see -- an inspiration from the past in the modern Mint. 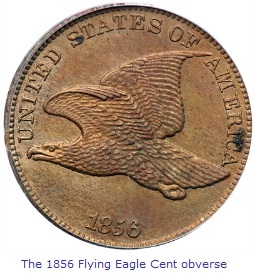 Legend has it that Peter was the model for the eagle on a few of our coins, such as the Flying Eagle cents of 1856-1858. Compare this photo of Peter with the image above and see if you notice any similarities between Peter and the bird on the Flying Eagle cent. 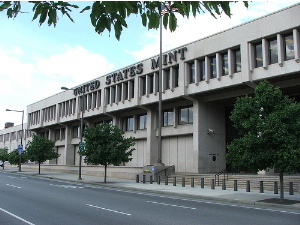 Anyone, coin collectors especially who is in the Philadelphia area ought to take a stroll through the Mint. Touring the US Philadelphia Mint is a fascinating experience for those of all ages and one that will be remembered for a lifetime. In July 2012, the Mint opened a new display, complete with artifacts from its earliest years. This was the biggest overhaul of the visitor area since 1969. Check out the USA Mint web page for tour instructions. All tours are free. 1 Reiter, Ed. Guide to Coin Collecting. New York, NY: The New York Times Company, 2002. 2 Taxay, Don. The U.S. Mint and Coinage. 5 Wohlman, Paul. The U.S. Mint. New York, NY: Chelsea House Publishers, 1987.